The digital industrial transformation of industry is taking root in some surprising places--and at an incredible scale. When I started at General Electric I was impressed by the company's vision for digital industrial transformation: Not just a pilot project in a silo business, but a horizontal push across all of GE’s industrial businesses. With 300,000 employees and 450 industrial facilities globally this seemed like an insurmountable challenge. Our efforts so far have been worthwhile. In fact, we have released over a billion dollars in productivity gains to date, including $730 million last year in 2016 alone. We expect to match that figure this year, and reach $1 billion in 2020. We also started GE Digital, where I run the Europe, Russia, and CIS organization, to help take this incredible capability to our customers. This is a big deal. Companies like BP, Exelon and DB Cargo see the value of enterprise-scale digitalization. Digitalizing a company as vast as any of the above could be considered a challenge, but digitalizing an entire industrial conglomerate covering energy, transportation, utilities, and beyond could be considered even more ambitious. And I’m not talking about GE. On Sept. 6, 2017, I was honored to hold a signing ceremony with Samruk-Kazyna at the IFSWF Forum in Astana in Kazakhstan. Samruk-Kazyna's portfolio companies cover industries as diverse as oil and gas, rail transportation, power generation, and electricity transmission--a portfolio that mostly maps to GE’s core industrial businesses. In January 2017, President Nazarbayev announced the digitalization of Kazakhstan’s entire economy. 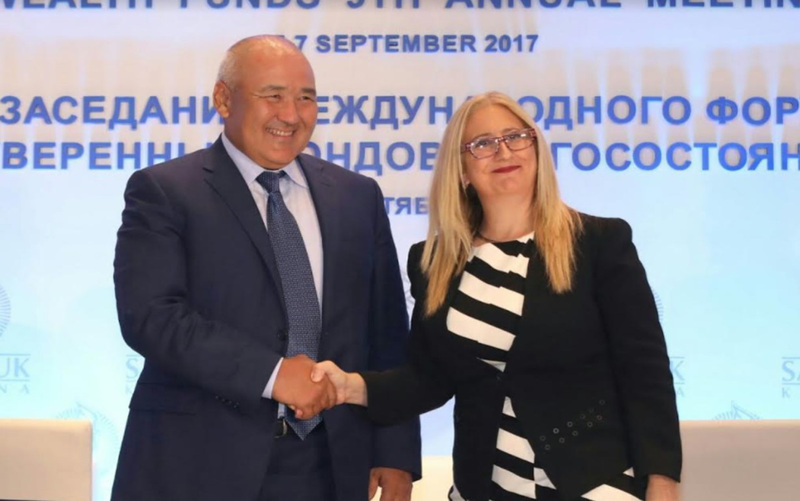 Samruk-Kazyna is an important part of that strategy covering many of the nation's industries and their goal is to deliver on this mission in order to supercharge Central Asia’s largest economy. It is an honor to be asked to be part of that journey. There are lots of reasons why GE is uniquely positioned to help industrial companies with their digital capabilities–after all we have 125 years’ experience in doing this all around the world (and 75 years in Kazakhstan). But one of the key reasons why GE is considered to be the preferred partner by Samruk-Kazyna is not just our industrial heritage, but the fact that our platform for the industrial internet, Predix Platform, is open. So what does that mean? At GE, we believe the only way to build a platform for the industrial internet is to make sure that it works well with other technologies as possible. To be successful, we know that Predix Platform and our industrial applications have to be accessible and available to create value quickly for customers. And that means making the platform easy and accessible for developers too. Since launch in February 2016, we have already grown a community of 33,000 developers around the world, with 100s of apps on the platform. By bringing our Predix Platform offer to Kazakhstan, we will also be helping Samruk-Kazyna to build a new generation of digital-industrial data scientists and software engineers who can use digital technology to answer the specific challenges faced on the ground. Beyond skills, our expertise will also help to boost productivity and economic growth. Industrial leaders that are still skeptical about digital industrial transformation take note: Digital industrial transformation is being adopted more quickly and in more places than you might expect–and I’m left in no doubt that because Kazakhstan is open to digital industrial transformation, it will be successful in scaling its economy as well. Connect, optimize, and scale your digital industrial applications.